To have even a 50/50 chance [of winning the LCS], a team must be a .606 (98 win) team--relative to its playoff opponents. Even if the playoff opponents are of just .525 true quality, Log5 estimates that the .606 team would be a true quality .630 (102 win) team. 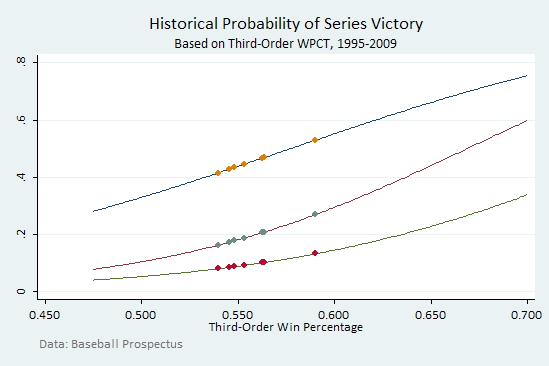 Of course, to average a 33% shot at winning it all, you need a 50% shot at winning the pennant. How does he know this? Basically by running the same type of simulation I did with generic numbers. What this means is that the market is pricing the Phillies as a .630 team even though they've played the full season as a .553 true quality (read, third-order win percentage) team. 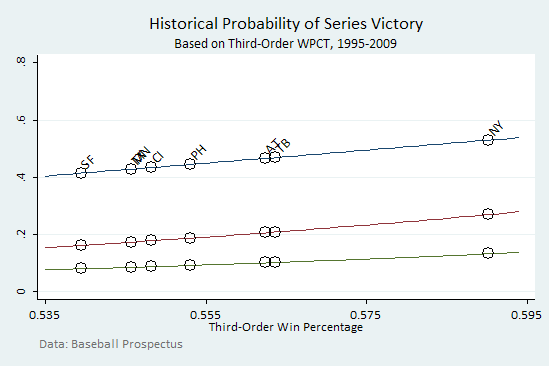 The top line indicates probability of winning the LDS, while the next two represent the LCS and World Series, respectively. Historically, in order to have a 2:1 shot to win it all, a team would require a third-order win percentage about 0.125 higher than the 2009 Phils. In short, the Phils may be a great team. They may even win the World Series. However, based on what we know about the historical relationship between true talent and playoff success, 2:1 seems a bit outlandish.